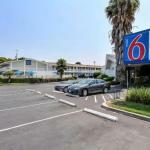 A seasonal outdoor pool cable TV Wi-Fi and affordable rates make Motel 6 Sunnyvale South a smart budget move for our guests. The 58 rooms on the two exterior-corridor floors of this motel offer cable TV with expanded channels Wi-Fi (for an extra fee) and free local calls. Non-smoking rooms may be requested. Guests can take advantage of free coffee in the lobby each morning and enjoy a refreshing swim in the outdoor pool. The hotel provides a guest laundromat and free parking. Pets are welcome. Just off Highway 101 the motel is three miles from downtown Sunnyvale and Sunnyvale Municipal Golf Course. The Santa Clara Convention Center and Paramount's Great America theme park are both less than four miles from the hotel. Test your smarts at the Computer History Museum five miles away. The Tech Museum of Innovation Winchester Mystery House and concerts or sports events at HP Pavilion are within a 15-minute drive. It's eight miles east to San Jose International Airport.